Home/Senior/McEvoy and Byrne claimed the top spot! In a very hot national indoor arena in Abbotstown in Dublin Kilkenny City Harriers athletes donned there black and amber singlet to take on the best of Ireland in the AAI open games. There was a fantastic atmosphere and great cheer as all athletes took on their own and showed their talent. Shay McEvoy had a magnificent performance to set a new PB and take the top spot in a 3k time of 8.42 minutes. 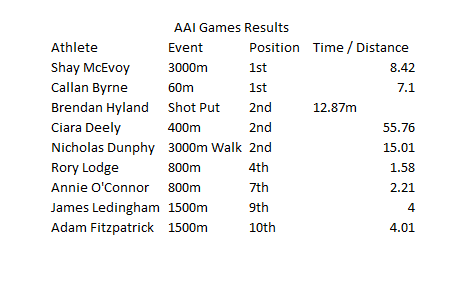 Callan Byrne also claimed the top spot over 60m in a time of 7.1 seconds. It was also great to see Rory Lodge back from injury and out on track with a 4th place finish with a 1.58 minutes for 800m. Brendan Hyland had a good season opener coming second with a 12.87m throw not far of his PB of 13.20. Check out the rest of the results below.